Hi! My name is Mercedes Hutchens. 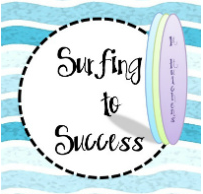 I have a blog called Surfing to Success. 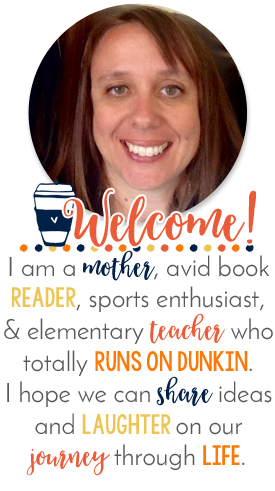 I’m excited Michele gave me this opportunity to be a guest blogger on Coffee Cups and Lesson Plans. I am currently teaching 5th grade. I work with a wonderful team of teachers and have the opportunity to departmentalize so I get to teach math three times a day. (I also have my homeroom and teach ELD.) This is a new experience for me. I’ve been teaching 15 years but most of those were in 1st and 2nd grade. I am loving teaching mostly math. It is so wonderful to have the ability to really focus on one subject. That said, can you guess what I want to talk to you about today? Yep, Math. But, if you stick around there is a freebie at the end that can actually be used in almost every grade. I’m in California. I’m feeling a bit like I’m playing catch up with the rest of the country when it comes to the Common Core. We in California are still being tested on the California State Standards this year. My district isn’t completely sure what we’ll be tested on next year but we will definitely be tested on the Common Core the following year. I feel like that puts me in this weird transitional period. In the years to come, my students will be learning Common Core standards. I feel I need to prepare them not only for this years test, but also for the years to come. Ever feel like you’re being pulled in so many directions you might as well stand still? 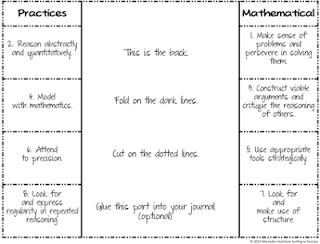 Well, I can’t let myself do that so this is where the Common Core Mathematical Practices come in. 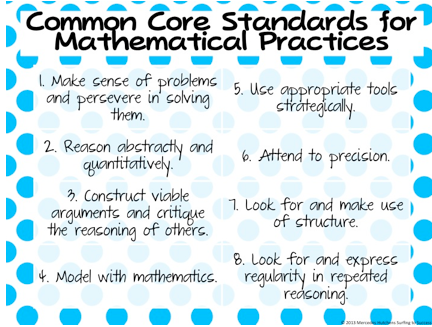 The Common Core Standards for Mathematical Practices are a part of the Common Core Standards for K-12. It’s nice to have something in common with other grade levels. I love to collaborate with the math teachers in the grades above and below me and plan on ways to give the students some consistency from grade to grade and now we have these eight math practices in common. Attending to precision or persevering in solving problems will be drastically different in Kindergarten then it is in high school, but it is wonderful to know that over their school career the students will have a common language from year to year that will help them become amazing mathematicians. I’ll be honest. I’m just getting started. I’m not exactly sure how I’m going to make the leap from the California Standards to the Common Core standards but I do know that I’m going to start by using these practices to bridge the gap. For now, I’ve created a foldable. I plan to have them glue it into our math journals. 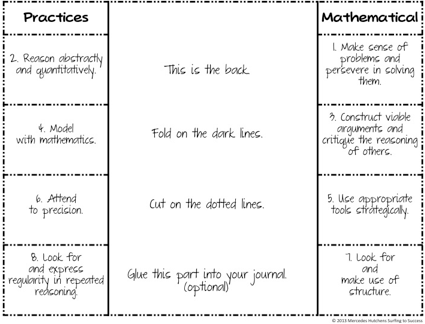 As we learn and use a practice, we will open up to our foldable and take notes and probably put an example. 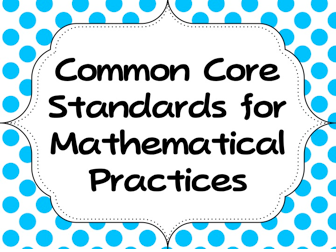 Have you introduced the Common Core Standards Mathematical Practices to your students? Do you have tips for me? 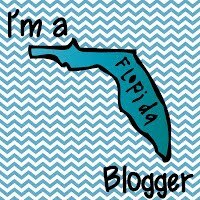 I’d love for you to hop over to my blog http://surfingtosuccess.blogspot.com and consider following me. Maybe you can be part on this journey into the Common Core. I like to give away freebies. Some are math and some are backgrounds and clipart. Stop by and say hi. Isn't Mercedes great! 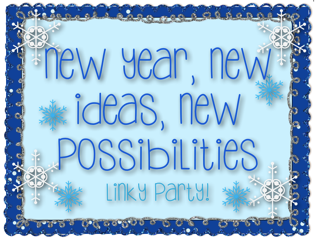 So many of these bloggers on this Blog Hop have fabulous ideas! We are going to common core in Indiana (K and first are full common core) and now there is talks of leaving the common core and going back to Indiana state standards! Can't seem to keep up! We too are heading towards Common Core in Colorado. I was so excited to see your post because two of my colleagues and I are doing a PD on Tuesday about the Standards for Mathematical Practice. Thanks for sharing your awesome work! This is our first year of just using Common Core and it has been a big change.